Life as a Jane Doe: meatball hoagies. 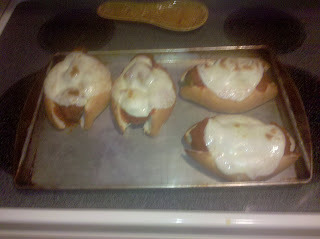 Last night, I made meatball hoagies for dinner and thought I would share the recipe. YUMMY! & so easy! Pre-heat oven at 350 degrees. Grease baking pan with cooking spray. Mix together the meat, eggs, bread crumbs, garlic powder, and italian seasoning and form into 24 meatballs. Place meatballs on baking pan and cook for 30 minutes; turning meatballs over at the midway point. Cut italian bread into halves and place slits in them for the meatballs--making four hoagies. 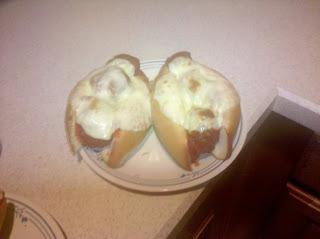 Place cooked meatballs into hoagies and cover each hoagie with 2 tbs of pasta sauce. Place one slice of provolone cheese on top of each hoagie. Broil on middle rack for 3 minutes. By the way---my friend informed me that my math skills (or lack there of) portrayed themselves in this post. It was 3/4 tbs of garlic powder & not 2/4---which is OBVIOUSLY 1/2! DUH.